Disparate information, spread over various sources, in various formats, and with inconsistent semantics is a major obstacle for enterprises to use this information at its full potential. Information grids should allow for the effective access, extraction and linking of dispersed information. Currently Europe's corporations spend over 10 Billion Euro to deal with these problems. This book will demonstrate the applicability of grid technologies to industry. To this end, it gives a detailed insight on how ontology technology can be used to manage dispersed information assets more efficiently. The book is based on experiences from the COG (Corporate Ontology Grid) project, carried out jointly by three leading industrial players and the Digital Enterprise Research Institute Austria.Through comparisons of this project with alternative technologies and projects, it provides hands-on experience and best practice examples to act as a reference guide for their development. 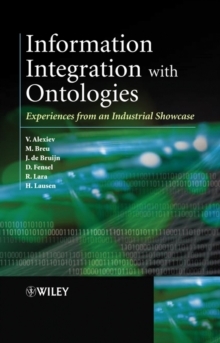 "Information Integration with Ontologies: Ontology based Information Integration in an Industrial Setting" is ideal for technical experts and computer researchers in the IT-area looking to achieve integration of heterogeneous information and apply ontology technologies and techniques in practice. It will also be of great benefit to technical decision makers seeking information about ontology technologies and the scientific audience, interested in achievements towards the application of ontologies in an industrial setting.